River Relay contingent gets a warm greeting on the docks at Amelia Island, FL. For our 25th birthday party, we spent 2 months celebrating nature and forging new partnerships. 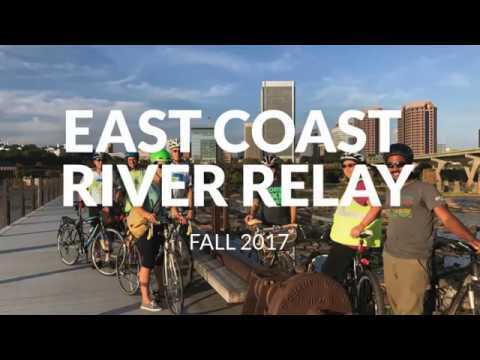 From August 24 to October 28, 2017, we made our way south along the East Coast Greenway. We celebrated 25 years, 50 rivers, and 1 Greenway. We met Greenway friends old and new, honored the work of local officials (and several governors), and encouraged more people to get out and enjoy this unique route. Thanks to all who joined us for the largest program in our organization's history. To present this unique series of events — the largest in our organization's history — we are proud to have partnered with more than 200 local, regional, and national organizations. Together, we're working to deepen the connection between people and place: our communities, the Greenway, our rivers and watersheds, moose and manatee, loon and heron. The 50 rivers the East Coast Greenway follows were essential to the creation of our nation and continue to hold an important role today. They provide drinking water to millions of Americans, give homes to thousands of species of wildlife, offer a playground for outdoor recreation, and much more. Rowers on the Seekonk River in Providence, R.I.